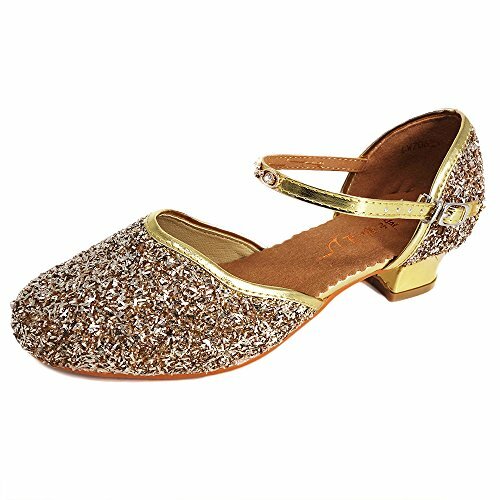 Girls Glitter Sequins Pump Shoes Princess Dress Sandals Party Ballet Dance Shoes adopt high quality to give kids better protection. Dance shoes are essential for every little girl to practice every day. We commit to providing personalized, comfortable, cute and fashion products for growing children. Let little prince and princess enjoy their childhood with happiness and confidence is our's mission. Girls pump shoes with ankle strap and buckle closure, easy to pull on/off and adjust an optimal fit. Featuring waterproof leather material with glitter sequins and fashion rhinestones on the strap. Closed toe and low heel (Heel Height: 1.38 inches) design provide kids more protection. Natural rubber sole with texture, soft, sturdy, durable and anti-slip. Suitable for various occasions: school, outdoor, party, wedding, dance class, etc.